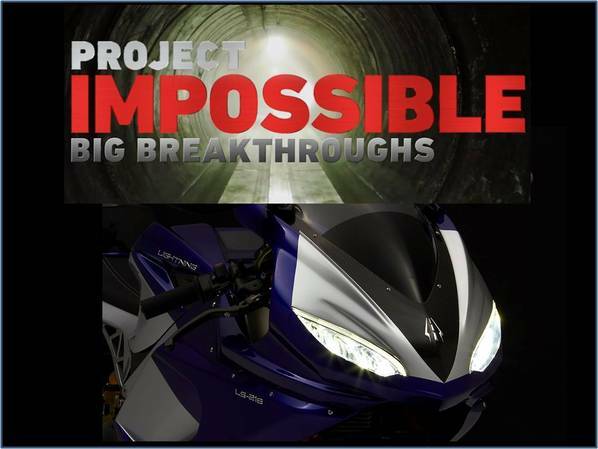 Project Impossible is an original series that follows a new generation of epic engineering projects that were considered unthinkable just a few years ago. Each episode is a deep look into the ambitious projects transforming our world, and highlights the people, tools and technological breakthroughs critical to their success. Lightning is the lead story, along with the Hyperloop and the Fusion Reactor in this episode. Lightning Motorcycle kicks off the Project impossible marathon at 5AM PST/8AM EST on DirectTV and 8AM PST/11AM EST on Cable. This show will be aired around the world. Check your local list for your local schedule. Don&apos;t miss this exciting show and set your DVR to record the show. Click here to download the trailer or click here to watch on Facebook.